On November 16, among other things, MapStory announced the launch of GeoBadges on its blog. 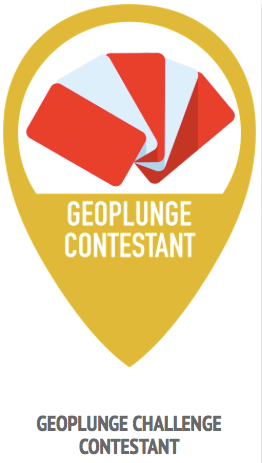 This is also the week we launch GeoBadges.org out into the wild. GeoBadges is a digital badging platform that helps drive informal learning and community service within the broad field of geography. MapStory kickstarted GeoBadges with a grant from the Longview Foundation, and has since handed over stewardship of the project going forward to the American Geographical Society. In honor of OSMGeoWeek we’ve teamed up with TeachOSM to offer the first two OpenStreetMap badges targeted at new mappers and mapathon event organizers. Check it out! I recognized all the issuing organizations save GeoPlunge (@GeoPlunge). Best I can tell it's a card game that helps students learn geography facts which has been popular in DC for some years. I was surprised to find badges from OGC for participating in a OGC Technical Committee Meeting. Faculty members in the University of Delaware’s Department of Geography have launched the DelawareView (DEView) consortium to improve public access to remote sensing and geospatial data. DEView is an affiliate member of AmericaView, a national network of remote sensing scientists and GIS scientists, funded by the U.S. Geological Survey, who support the use of Landsat and other public domain remotely sensed satellite data for research, education and technology transfer. The university paper covered it on GIS Day. Don't miss any GIS education news. Subscribe to receive this newsletter via e-mail every Thursday - well expect today since it was delivered on Wednesday due to the Thursday Thanksgiving holiday in the United States tomorrow. The Department of Geology and Geography at West Virginia University, together with Texas Tech University and George Washington University, have developed a new program called Mapping for Resilience. The program is supported by a $1 million grant from the United States Agency for International Development. The program launched Tuesday in the Rayburn House Building on Capitol Hill as part of the national Geography Awareness Week. I'm not sure what makes this program new or different than say HOTOSM, except that it involves students and government money. The Northwest News Network details the ups and downs of teaching about UAS technology in the United States. One valuable geographic note: schools in the northwest take their hardware to Australia and Canada to fly without FAA regulations. Robichaud science teacher Susan Heiss-Ransom spearheaded the project to make the high school a Global Information System Arc Org site. The article goes on to explain how the students used the software to explore where to put a wind turbine on school property. That may even happen via a partnership with the University of Michigan-Dearborn’s Gear Up program. The school is part of the GIS/T Resources and Applications for Career Education Program (GRACE). I follow GRACE on GeoNet and found the source of the original errors. I pointed them out to the article author. I also suggested that Esri's @GISEd do so when it tweeted the article. I'm pleased to report it's been updated! On the other hand, I asked about an image credit, "Photo courtesy of Google Images," which remains. Earlier this month the Centers for Medicare & Medicaid Services (CMS) put out a map of Medicare Part D opioid prescription claims (press release). I love that someone involved with pain management actually questions the map outright. The National Pain Report's Doug Lynch, a former pain patient and partner in the publication asks: "How does this map 'ensure that individuals with pain receive effective treatment?' How does this map help anyone in pain?" I'll add questions: How does this map help address the crisis? What questions can it answer? What map might you make instead? Maptime Madison studies, teaches modern mapmaking technology covers last week's meeting in Madison, WI during Geography Awareness Week. I hadn't thought of it before, but clearly Maptime is aiming to create a number of learning communities around maps. Not familiar with the concept? I first heard about it as part of a MOOC I took last year. Colin Higgins of Middleton, WI became UW-Madison’s 32nd Rhodes scholar. He receives a scholarship to study for two to three years at Oxford University in England. He's now pursuing an accelerated Master of Public Affairs degree, but graduated college last May with a triple major in environmental studies, geography and history. Esri Education GIS Conference Call for Paper Deadline Extended to 12/2. Submit your abstract here. Why the extension? No reason given. Do all these extensions say anything about the event host? Those participating? Will extensions ever stop? I think not. When I asked for more information he noted a webpage on it is under development. Suggestion to others interested in reaching out to educators: make the webpage addressing educators needs first, then promote it. In this article, the growing educative role for webGIS, both conceptually,technically, and practically will be explored, including the new affordances (e.g. collaboration, real-time data, distributed data, BYOD support, and interface customization) and constraints (e.g. bandwidth, privacy, and user management)provided by GIS in a cloud-based platform. Finally, considerations for preparing for new and pre-service teachers of webGIS, including pedagogical and technical considerations, will be discussed – providing a broad vision of the future of webGIS and how learners and educators can best utilize and prepare for that future.